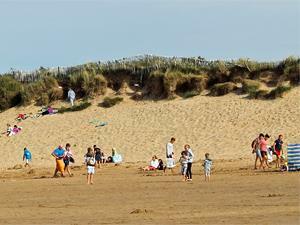 Brancaster Beach01485 532610work BeachFrom the Hunstanton direction, the further around the West Norfolk coast you go, you will discover the quieter pleasures on Brancaster beach, with its natural dunes. From the Wash, around the long coast of Norfolk, the sea gradually retreats, giving rise to sandbanks, spits of land and silted harbours. Brancaster at low tide shows wide expanses of mud, which are important feeding areas for many birds (much of the landscape now being managed by the National Trust) and a history of shellfish farming. For Brancaster today, sailing, fishing, and trips to see the seals are common pastimes for boat owners and visitors to the coast. There are mooring opportunities for small leisure craft at points along the Wash to aid avid sailors in their exploration of the coast. see the Sail the Wash website for more details. Nearby Scolt Head Island is an offshore barrier island near Brancaster. The island is a National Nature Reserve comprising of sand dunes, salt marsh, intertidal sand and mud flats, and shingle. During Spring and Summer a ferry connects the island with the village of Burnham Overy Staithe, which is next to the creek-side Burnham harbour – a major recreational centre for sailing. From the Hunstanton direction, the further around the West Norfolk coast you go, you will discover the quieter pleasures on Brancaster beach, with its natural dunes. From the Wash, around the long coast of Norfolk, the sea gradually retreats, giving rise to sandbanks, spits of land and silted harbours. Brancaster at low tide shows wide expanses of mud, which are important feeding areas for many birds (much of the landscape now being managed by the National Trust) and a history of shellfish farming. For Brancaster today, sailing, fishing, and trips to see the seals are common pastimes for boat owners and visitors to the coast. There are mooring opportunities for small leisure craft at points along the Wash to aid avid sailors in their exploration of the coast. see the Sail the Wash website for more details. Please note, it is important to check the Brancaster tide times as, when there is a high Spring tide, the road to the beach can become flooded. It’s not advisable to drive through this high water.